Last Wednesday’s hearing on the raw milk and permit fees bills went very well, and we had tremendous support from our grassroots. THANK YOU to everyone who attended – your presence and testimonies made a big difference! Over 100 people registered in support of HB 46, the bill to allow licensed raw milk farmers to bring their products to farmers’ markets and delivery points. We had strong testimony from several of our farmers, registered dieticians, and passionate consumers, including a very articulate 11-year-old girl who shared her story of years of extremely painful eczema finally being solved with a change in diet that includes raw dairy. The Committee members asked good questions throughout the hearing. As expected, the Texas Dairymen’s Association, Texas Medical Association, Texas Pediatrics Association, and the Harris County Health Department opposed the bill. The hearing on HB 910, the bill to limit permit fees for farmers and farmers’ market vendors, also went very well. In addition to FARFA’s testimony, the Committee heard from the Texas Organic Farmers and Gardeners’ Association, the Sustainable Food Center, and the organizers for the Cedar Park & Mueller Farmers’ Markets and Magnolia Farmers Market. Over 70 other people registered their support for the bill. 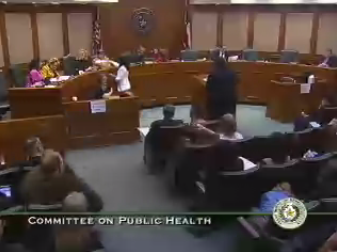 The Committee has left the bills pending, which is normal procedure. We are discussing possible changes to address the opponents’ objections, and we hope to see the committee vote on the bills within the next two weeks. 1) Call or email your State Representative to urge him or her to co-author HB 46 (raw milk) and HB 910 (limiting fees). You can find out who represents you at www.fyi.legis.state.tx.us or by calling the Texas Capitol Switchboard at 512-463-4630. Having more co-authors is very important, both to getting the bills out of Committee and the steps after that! 2) Then email all of the Committee members (see the list at the end of this post) to urge them to approve these bills as soon as possible. 3) Share our press release, Local Food Bills Heard by the Texas House Public Health Committee, with your local media, and ask them to follow the progress of the local foods bills. Special thanks to Representative Dan Flynn, the author of HB 46, and his joint and co-authors: Representatives Dennis Bonnen, Jodie Laubenberg, Bill Zedler, Lance Gooden, Lyle Larson, Rick Miller, Eddie Rodriguez, David Simpson, and Steve Toth. Special thanks also to Chairwoman Lois Kolkhorst, the author of HB 910, and to Representative Eddie Rodriguez for joint authoring the bill. Please help us move HB 46 and HB 910 forward!